Close to my company's sim I noticed an island with an interesting pattern. I couldn't get access to the island, but the layout sofar is inviting. 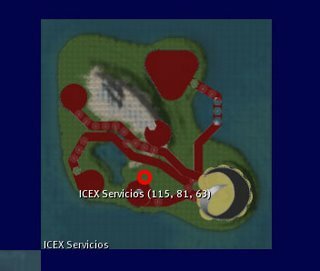 As far as I can tell from the logo in the bottom right corner, the ICEX Servicios sim is set up by the Instituto Español de Comercio Exterior. Alas, my Spanish is a little rusty, so I can't tell you what it's all about.